Team Meat has crushed any hopes of its sadistic platformer Super Meat Boy making a November release on the Wii. 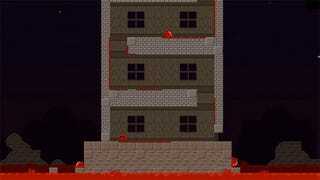 The indie developer says squeezing the game down to WiiWare size is responsible for delaying the game's release. Addressing the "internets," Team Meat says that a November release on WiiWare is "impossible," saying it has not yet compressed the full game below the 50 MB mark. The developer is aiming for something even leaner, 39 MB, according to the game's official Twitter account. Super Meat Boy features more than 300 levels, multiple playable characters and numerous art styles, resulting in a game the developer's weigh in at a hefty 750 MB. On a more positive note, Team Meat says the PC version released through Steam will be available the last week of November. The Mac version will be released "later" and the PlayStation 3 version "never." OK, so that last bit wasn't so positive.